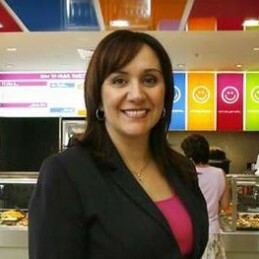 Katherine Sampson is the Founder and Managing Director of Australia’s largest and fastest-growing sandwich franchise – Healthy Habits . Establishing her first sandwich bar in 1992, Katherine has expanded her business to 35 stores throughout Victoria, ACT, New South Wales and Queensland, and plans to expand internationally. Born into a family she describes as “the Australian version of My Big Fat Greek Wedding”, Katherine Sampson was brought up to believe a woman’s destiny was marriage and motherhood. Accordingly, the founder and managing director of the Healthy Habits sandwich bar chain left school at 16 and did a law clerk’s course at RMIT. While her brother was aiming at university and a medical degree, she planned to work as a legal secretary until she had children. Every one of her relatives was a self-employed tradesman or small business owner. Her parents had started their life in Australia with a fish and chip shop, after which her father set up business as a builder. Her paternal uncles ran fish and chip shops, while her mother’s siblings ran a hamburger shop, a real estate agency and a building business. The message communicated by their example was one about hard work — and about the freedom that comes with running your own business. Her amazing business success had humble beginnings as Katherine, aged 27 and a single parent with two small children, dared to take the plunge and buy her first business, when a relative decided to sell their sandwich bar. Since then the popular and recognisable Healthy Habits brand has grown in terms of profitability, market share and prestige, which has greatly enhanced Katherine’s business acumen and experience. Most recently, Katherine sold an 80% share of the business to the Dymocks Group of Companies. This provided the infrastructure and investment needed to assist in the expansion of the brand across Australia and overseas.